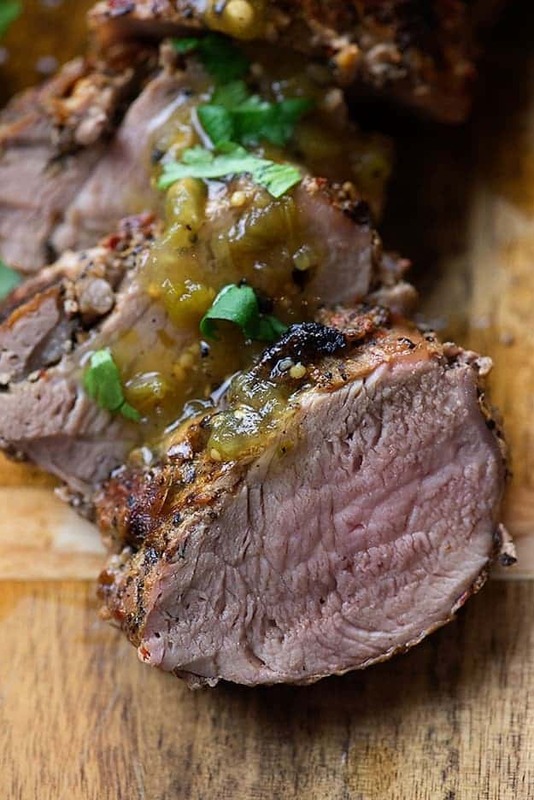 I love putting pork tenderloin on the grill and this recipe doesn’t disappoint. It’s topped with grilled tomatillo salsa for a burst of bright, fresh flavor! Big thanks to Smithfield for sponsoring this post! Alright, you guys. 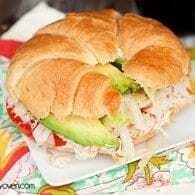 I’ve got something totally tasty for you today and I think you’re going to love the vibrant flavors in this one! I’ve been working with Smithfield for the past three years to bring you delicious ways to use their marinated fresh pork. I love their pork because it’s already packing a ton of flavor, which means that a lot of the work is done for you and you can get dinner on the table super quickly. My one skillet pork pasta recipe is the perfect weeknight dinner. Same goes for my easy pork stir-fry! I thought I’d get some south of the border flavors going on this time around with a simple grilled tomatillo salsa. The ingredients just get popped on the grill next to the pork tenderloin, so this is a super easy dinner with minimal clean up! I started with a Smithfield Roasted Garlic and Cracked Black Peppercorn Fresh Marinated Pork Tenderloin that I grabbed from the local grocery store. They have tons of flavor varieties, so check around and see what flavor you’d like to start with! Next up, I chopped up some fresh tomatillos, onion, and peppers to add to the grill with the meat. 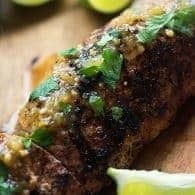 These get nice and charred and make a great roasted tomatillo salsa for serving over your pork tenderloin on the grill! 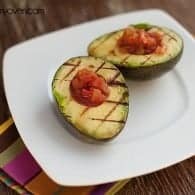 This really is an easy recipe and is perfect for novice grillers. A tenderloin looks like a pretty good size chunk of meat, but don’t worry that it’ll take a long time to cook through. I used high heat and it was cooked to 150 degrees in 15 minutes. Talk about quick! 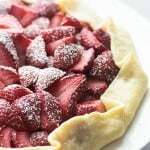 Serve this with my cauliflower risotto or corn casserole. For more Smithfield grilled goodness, check out this video for grilled pork and potato planks! Be sure to also enter Smithfield’s Real Flavor Real Fast contest for the chance to win some great prizes while taking a peak at some great recipes! 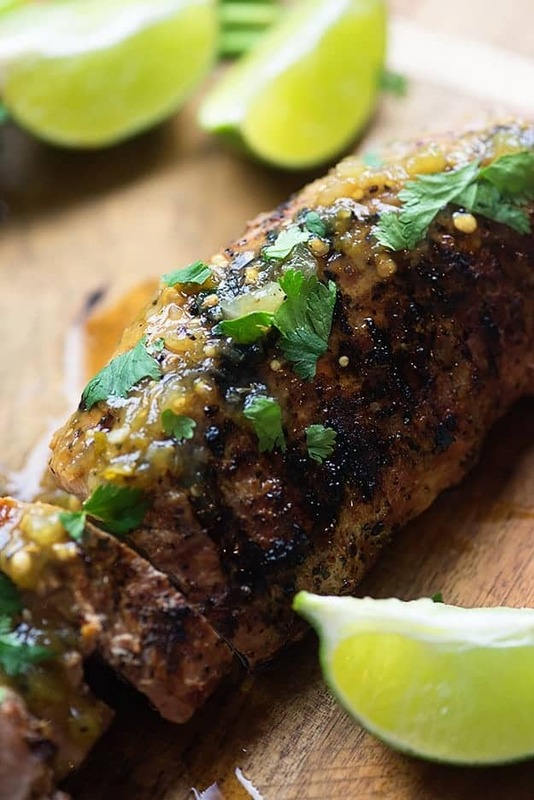 I love putting pork tenderloin on the grill and this recipe doesn't disappoint. It's topped with grilled tomatillo salsa for a burst of bright, fresh flavor! Heat the grill to 400 degrees on high heat. Cut the tomatillos and jalapeno in half. Place the tenderloin on the grill. Add the tomatillos, jalapeno, poblano pepper, and onion to the grill. Cook tenderloin for 8 minutes and flip. Continue cooking for 7 minutes or until internal temperature reaches 150 degrees. Turn vegetables as needed and remove from grill after 10 minutes. Place tomatillos, jalapeno, poblano, onion, cilantro, lime juice, and salt into a food processor or blender and process until mostly smooth. Remove tenerloin from the grill and let rest 5 minutes. Slice into 1/2 inch thick slices and drizzle the salsa verde over the top. 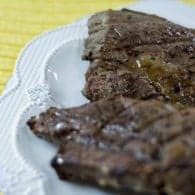 Salty Steak Marinade. It’s So Yummy. 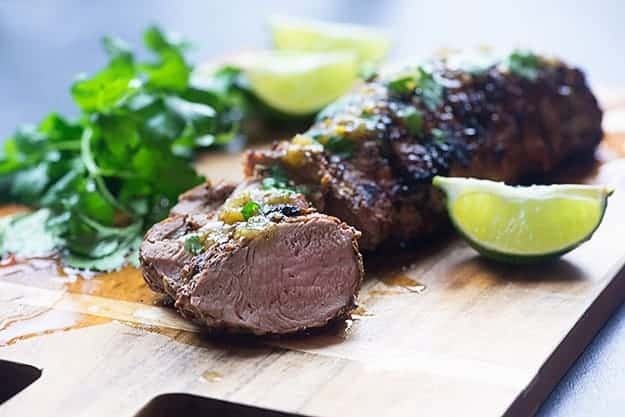 I love that they have pre-made marinated pork tenderloin, it makes it so much more convenient! Back in the early ’70’s we would take road trips from VA. Beach to Smithfield on Sunday afternoons. We took the old two lane highways and I can’t remember where but part of the trip involved a ferry ride. The best way to spend a lazy Sunday afternoon!! 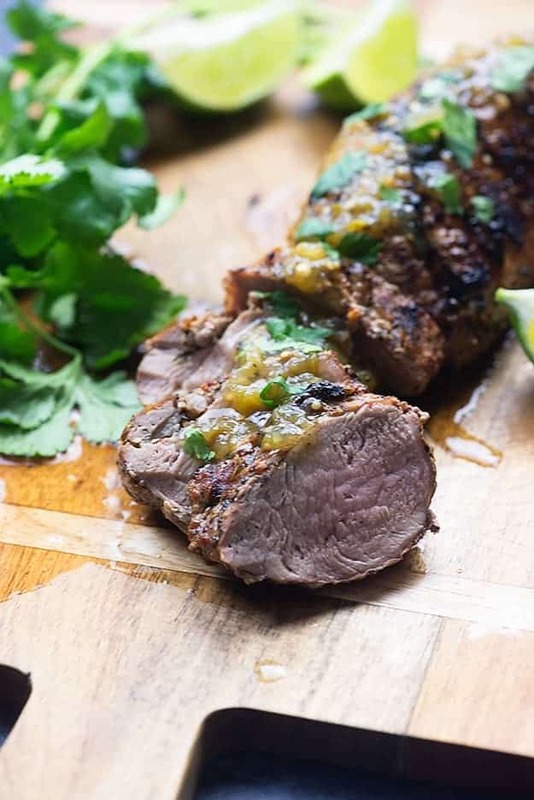 I love pork tenderloin and I’m always looking for new ways to make it. This looks like a keeper! Mmmmm I love salsa verde, and I think adding it to pork is a great idea. A perfect summer meal! 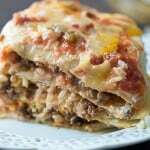 I was just looking for a perfect, fast and easy dinner for tonight – and I just found it. Thanks Karly!